Do you like Shimmery Holiday Wreaths? I sure do! Hello, this month the Imagine Artists in Residence are featuring the color Evergreen. 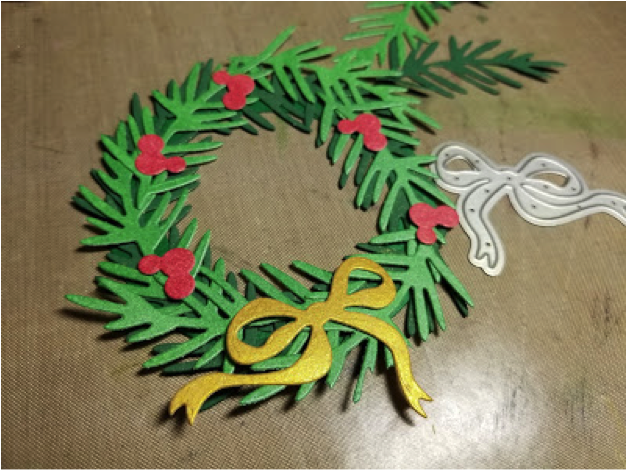 I decided to create a shimmery evergreen wreath as a centerpiece to this “Christmas Wishes” holiday card and I am going to show you how. 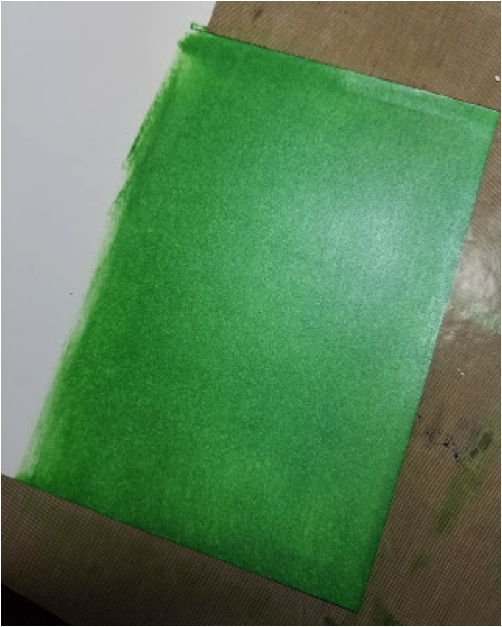 I started off with a piece of Mixed Media White Paper and covered it with Emerald Green Delicata ink. 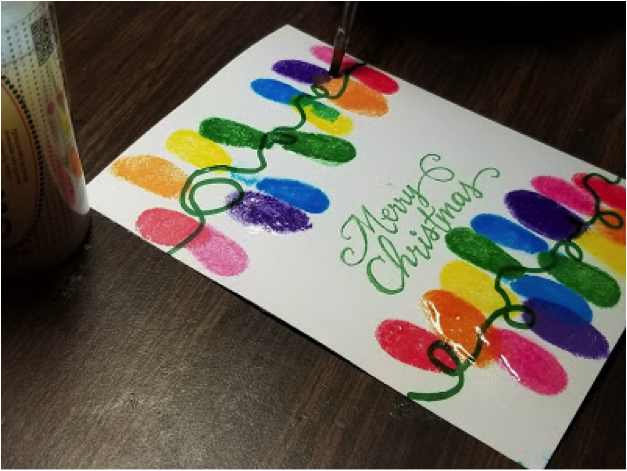 You can see the pretty shimmer this ink has. 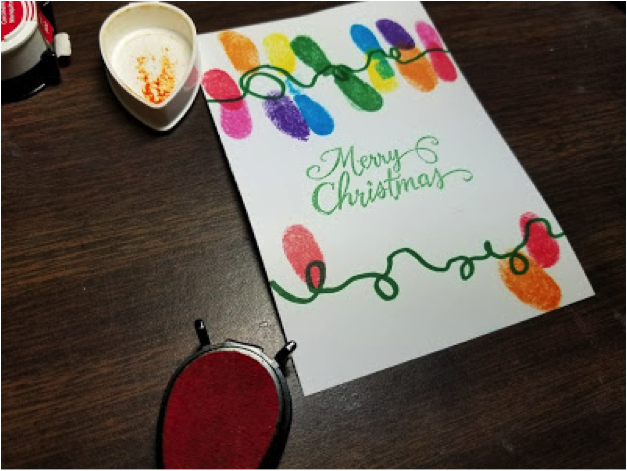 Although this is a pigment ink, it does dry quickly. But if you’re a little impatient, you can use a heat tool to speed up the process. 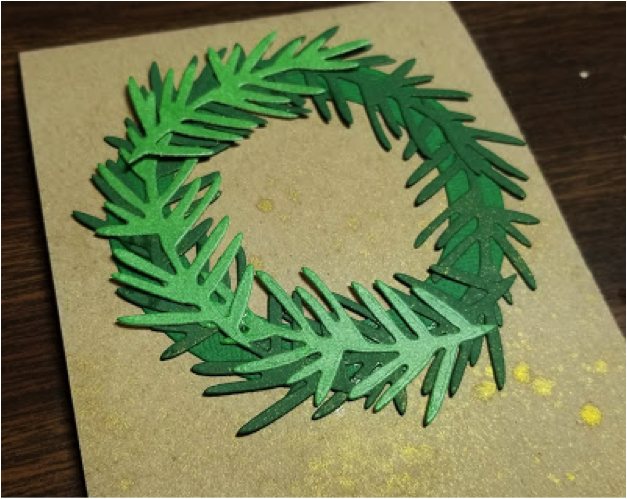 Using the “Build A Wreath” die set from Stampendous, I die cut several evergreen boughs from the inked paper. I also die cut the largest circle from the set with a colored piece of green cardstock. 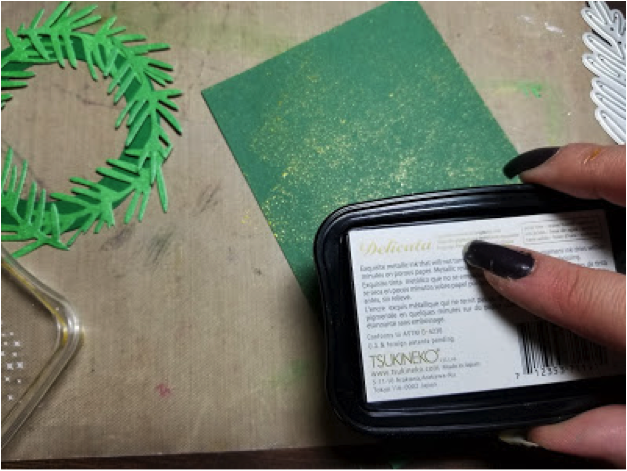 Using a deep shade of green colored cardstock, I tapped the surface with Golden Glitz Delicata ink to give it some sparkle and depth. 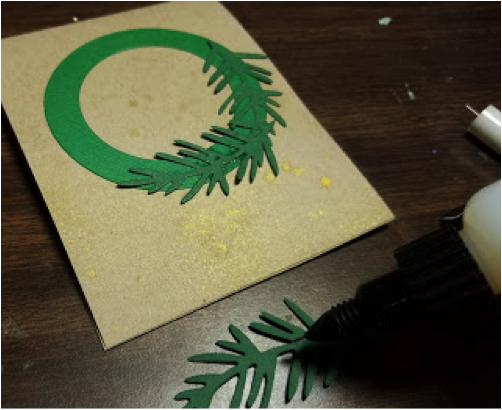 I then die cut the evergreen boughs out of this color too. I was satisfied with how these two layers looked, but it definitely needed some embellishing. There is a trio of berries in the die set, so I colored another piece of Mixed Media White Paper with Ruby Red Delicata. Then I die cut the berries. The berries looked good, but I love bows on wreaths. So I repeated the ink to paper process again with Golden Glitz Delicata and cut the pretty bow. Now it’s time to move on to the card base. 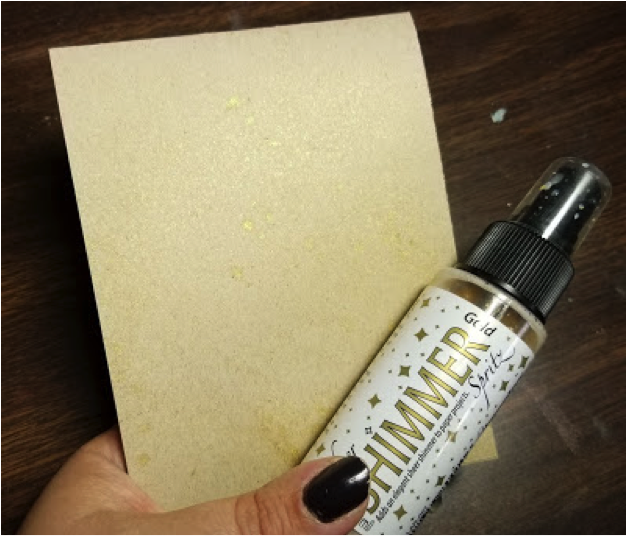 I used Neenah Desert Storm for my base, cut to 4 1/4″ x 11.” Then I sprayed it with Sheer Shimmer Spritz in Gold. This gold works perfectly with the Golden Glitz Delicata. Now it’s time to assemble the wreath. I glued down the wreath base first. I used On Point Glue for all of the assembly. This adhesive is perfect for these small, detailed pieces. I started with the darker, colored green cardstock pieces. As I glued each piece down, I placed a heavy acrylic block on top to weigh the pieces down as the glue dried. Next, I moved on to the Emerald Green colored pieces and repeated the same process with the glue and the block. Then I added the berries and the bow. 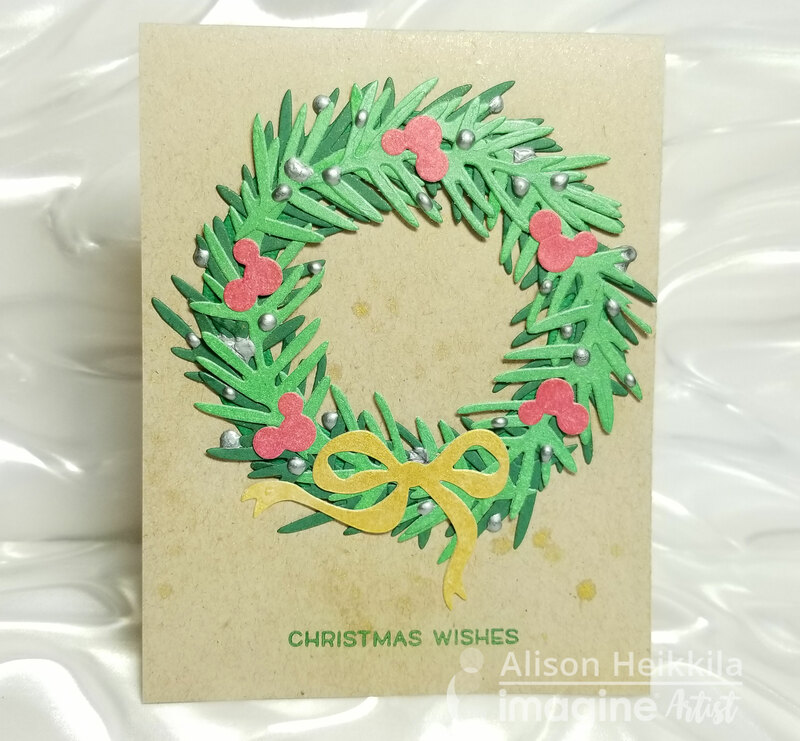 I completed the card with a simple “Christmas Wishes” sentiment from Lawn Fawn stamped in Emerald Green and by adding “ornaments” with Silver Irresistible Pico Embellisher. I love the additional texture the ornaments added. Here’s the completed card. 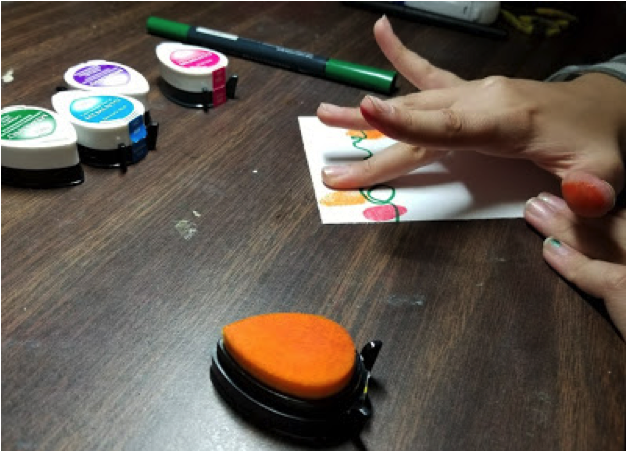 It’s fun to create your own colored paper using inks. I hope you’ll give it a try! Thanks for stopping by. Have an inspiring day! I love making handmade gifts, and of course, this is the perfect time of year for that. I decided to decorate a plain foaming soap bottle. Truth be told, I didn’t make this as a gift. It was for my house. But I will get a few more of these soap bottles and make them as gifts for people! StazOn Studio Glaze is a perfect craft product for this project because it adheres to non-porous surfaces like glass. To take it a step further, you can easily make your own foaming soap and add it to the bottle before giving it as a gift. Wouldn’t it make the perfect for a housewarming present? See my favorite recipe for soap at the end of the tutorial! 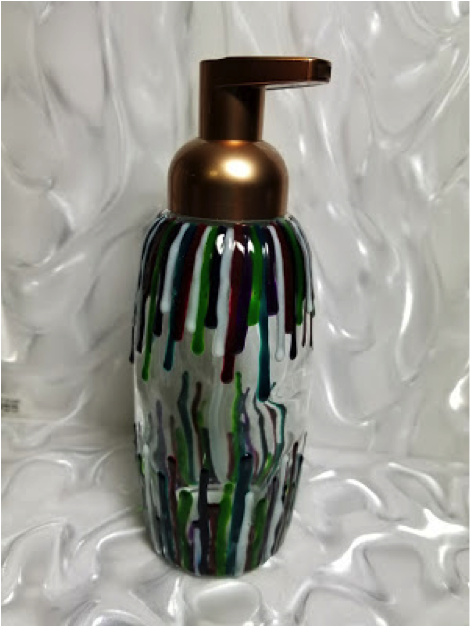 I bought this foaming soap bottle for about $6, and I knew right away that I wanted to use StazOn Studio Glaze to decorate it. 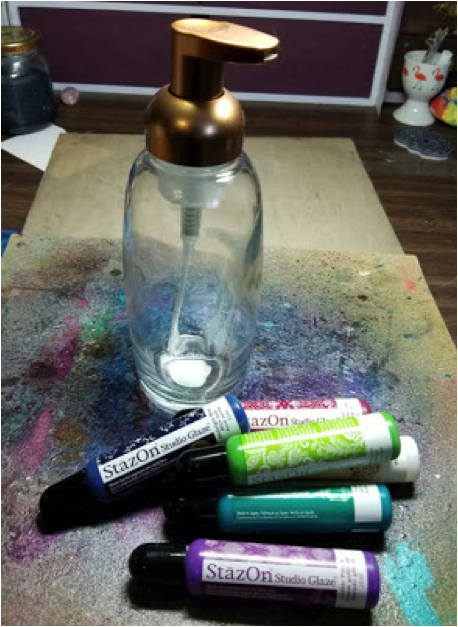 Wash the bottle down and chose colors of StazOn Studio Glaze. Turn the bottle upside down and apply lines of Claret Studio Glaze, allowing it to have a nice big drip at the bottom. 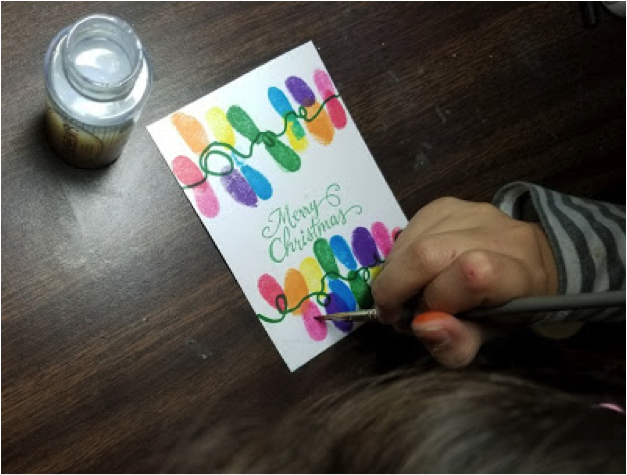 Vary the lengths of the lines and keep plenty of room in between them to add the other colors. TIP: I worked on a scrap piece of cardboard so that I could easily turn the bottle around without touching it. 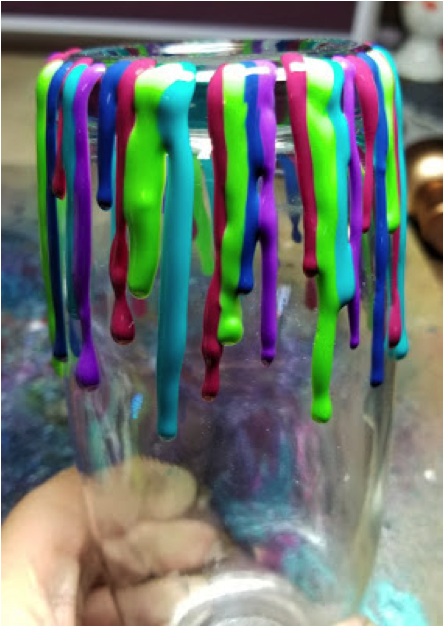 Continue to add colors with the same drippy, varying lines all around the bottle’s base. 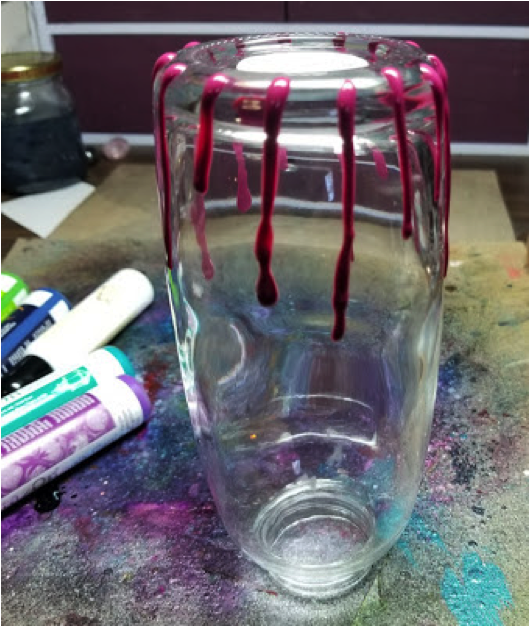 Make sure to not put any of the Studio Glaze directly on the bottom of the bottle so it will still sit flat on a counter. I made sure to not have a pattern. Some lines touch, while others have room in between them. I added four colors total. 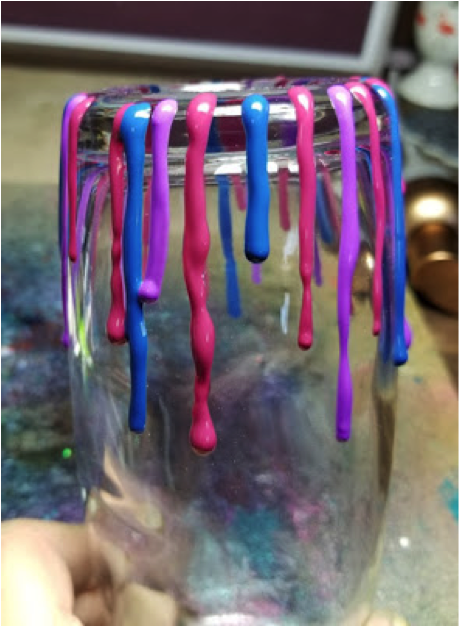 Keep in mind, the colors will look different (more translucent) once they are dried. Fill in any gaps with Cotton White. This process only took about 15 minutes to complete. After the Studio Glaze has dried, repeat the process along the top of the bottle as well. As you can see, when dry the colors are deeper and more translucent, but are still quite vibrant. I love the drips going in both directions, and my family thinks it looks great in our bathroom. 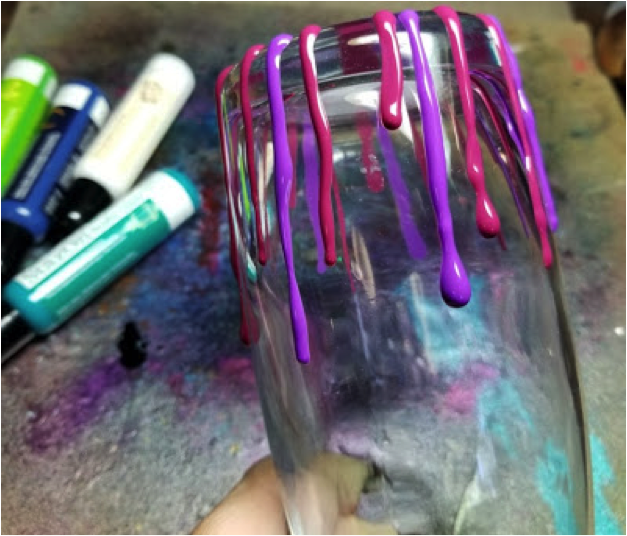 You can easily do this technique on an inexpensive set of drinking glasses or a mug. They could all make great gifts. Thanks for stopping by. Have an inspiring day! Enough water to fill bottle. Shake to mix! To celebrate the warm and cozy aspects of November our Color of the Month is Chocolate Brown! This color reminds us of Fall, Thanksgiving table decor, warm drinks such as coffee or hot cocoas and of course Chocolate! 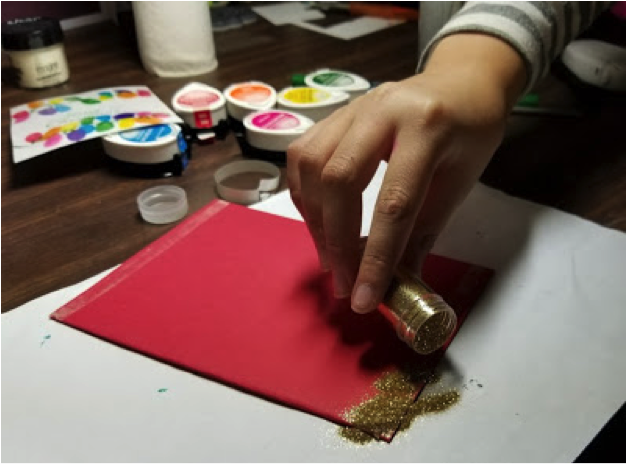 Next to black, brown is a very popular color in the Tsukineko and Imagine products so naturally we are excited to see what our Artist in Residence have cooked up this month in their crafting projects. 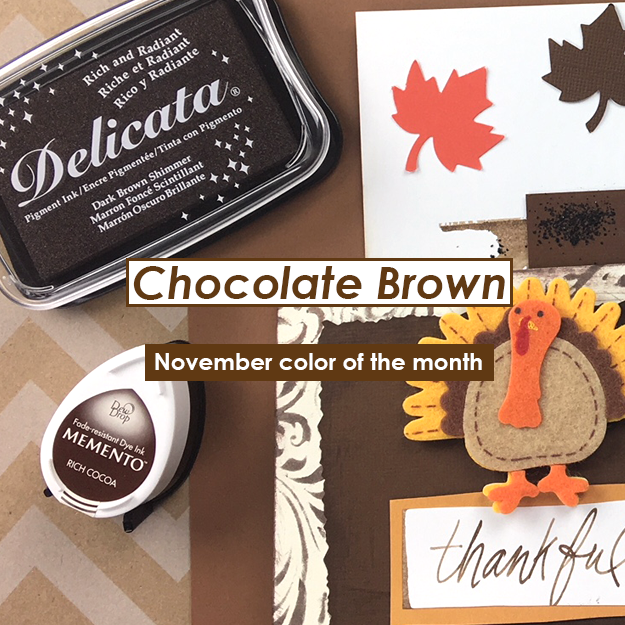 Of course if you use brown in any of your craft projects for November then please tag your work with #imaginecolorchallenge on Instagram! We might just have to repost some of them! Hello! For November, the Imagine Color of the Month is Chocolate. Yum! The color is rich and smooth, and immediately I think of how delicious chocolate can be. So I decided to make a card with food imagery. More specifically, I picked S’mores. I used Lawn Fawn’s Love You S’more stamps and Memento Ink in Rich Cocoa for almost all of my stamping. I like to use this color as a soft substitute for black. The S’mores were colored in with only a couple of Memento Markers. I used Lady Bug for the hearts and added a bit of White Gelly Roll for some faux shine. 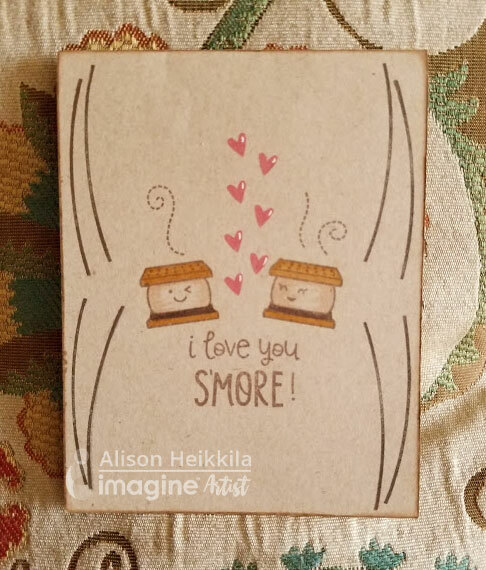 There’s a curved line in the Love You S’more set, and that’s what I used on the sides. They were stamped with Delicata Ink in Dark Brown Shimmer. I thought they made a fun border and helped draw the eye to the center of the card. I also inked my edges to ground the card a bit. This card came together really quickly, which is great because sometimes you just need to put a fast card together. It’s also really nice to step away from black and use shades of brown for a softer, rich look. Thanks for stopping by. Be sure to like this post or share on facebook and have an inspiring day! 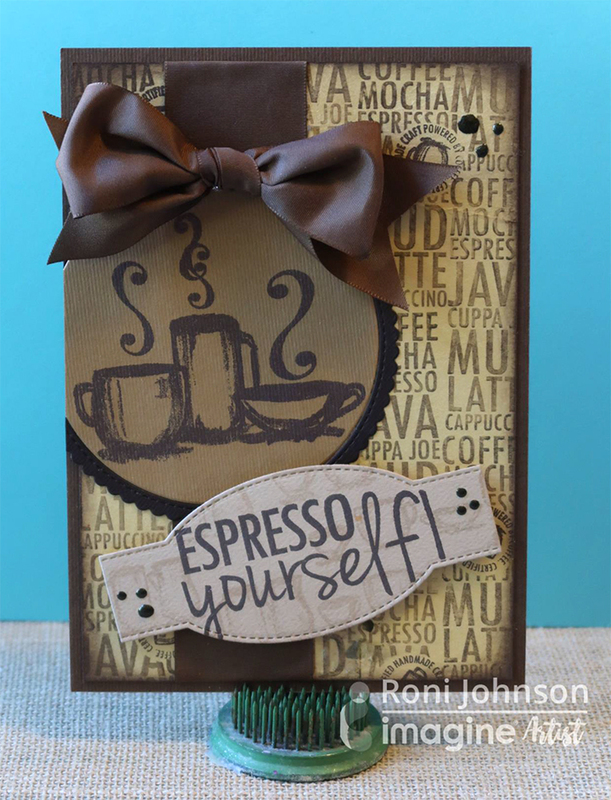 National Espresso Day is November 23rd and what a better way to celebrate than a wonderful card for a friend…Espresso Yourself! I couldn’t have chosen a better pairing with this holiday and this month’s color of the month – Chocolate. Imagine’s luscious Dark Brown Shimmer Delicata Ink and Memento’s Rich Cocoa were the main ingredients for this eye-opening card! Create the background by stamping the coffee cup circle motif with the Dark Brown Shimmer Ink. Stamp an extra image on scrap paper and trim to use as a mask. Mask off the first coffee cup motif and stamp the coffee text on the panel using Rich Cocoa ink; reposition the mask as necessary and continue to stamp the text until the entire panel has been covered. Stamp the large coffee mugs using Dark Brown Shimmer Delicata and die-cut the image as well as the scallop mat. Stamp the tiny coffee cups on a light brown panel using Desert Sand Memento Ink. Stamp the sentiment over top using Dark Brown Shimmer and die cut. 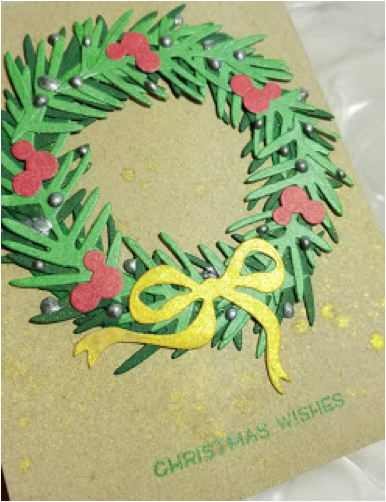 Assemble the elements incorporating the 1.5” ribbon and finish off the card with a few dots of Bronze Pico Embellisher. And there you have it! You are ready for a coffee date! Hello! I really enjoy working with wood, so I created a Halloween raven plaque that can be hung on the wall or on a door. Keep in mind, that you can use any combination of images you’d like. If you’re not a fan of crows, (gasp!) you can always use cats, pumpkin, witches, stars, etc. Using a 3/8″ stencil brush, I applied the brown shade that is in the VersaCraft Velvet palette. 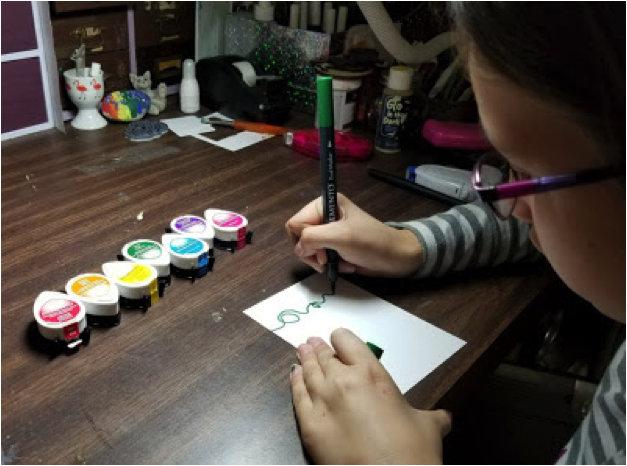 VersaCraft ink is fantastic for using on things that go way beyond paper. It’s great on fabric, for example. After the brown ink dried, I swiped Black (in the same VersaCraft palette) on the wood, following the grain to bring out the texture. I focused a bit more heavily on the edges to make the piece appear aged. Next I taped down my stencil. You’ll notice that the tape I used has been used before. I reuse my tape to minimize the stickiness of it so that nothing peels up when I remove it. I applied more Real Black VersaCraft ink, this time to the crows, with my stencil brush. Next, I stamped my raven skull, using the full sized pad of Real Black VersaCraft. I had it on hand already, so that just made it easier to stamp, since the image is so large. After that, I stamped my “Nevermore” sentiment with VersaCraft. I felt that the piece needed some more of something so I splattered some Wedding Dress irRESISTible with a liner brush, as well as some Golden Glitz Delicata ink from the inker. It added just enough texture and shine. Then I simply drilled two holes at the top and added some gold colored wire to hang it with. I hope you’ll give VersaCraft ink a try if you haven’t already. 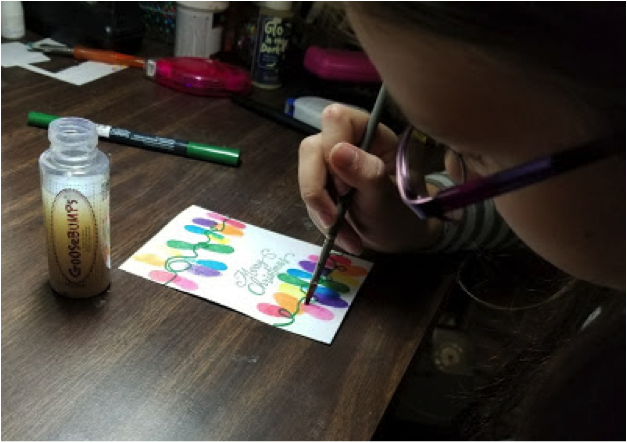 The colors are rich and opaque, and it is so much fun to experiment on other surfaces! Thanks for stopping by. Have an inspiring day! We are excited for the turn in the weather and to announce October’s Color of the Month Aubergine! This deep rich purple is inspired by the deeper colors of fall and the fun purple colors associated with witch costumes during Halloween. 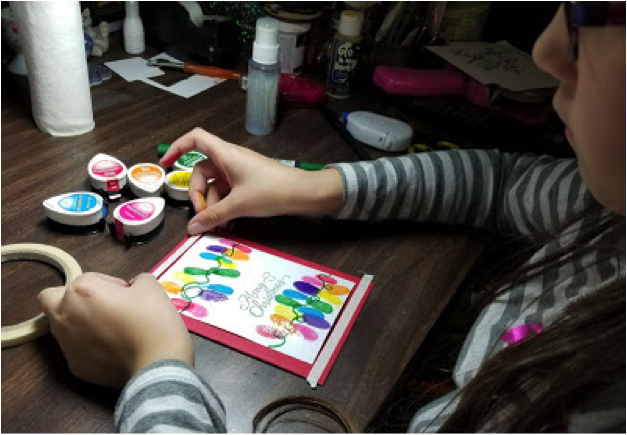 Stay tuned for another Color of the Month Challenge and in the mean time check out these gorgeous projects by Imagine Artists. Hello! The color of the month from Imagine is officially Aubergine, which is a beautiful, soft, muted purple. I decided to pair this color with shades of teal, which is one of my favorite color combinations. I stamped the Sunny Tile Stamp from Stampendous with VersaFine Ink and colored it with Memento Markers. 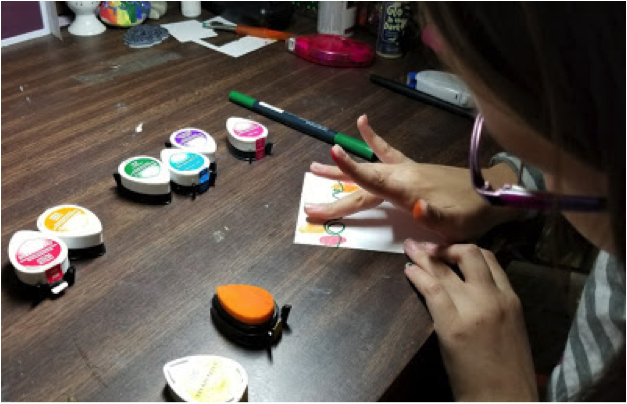 The color palette of the Memento Markers are so lovely, it’s easy to color in images and know that everything will work together harmoniously. Then I trimmed it out and and found some aubergine colored cardstock. I sprayed the lighter colored cardstock with Sweet Plum Fireworks! and the deeper color with Sheer Shimmer Spritz in Frost. I also added a lovely sentiment from Hero Arts with Eggplant VersaMagic. This card came together very quickly once my image was colored. And I just love these colors together. Thanks so much for stopping by. Have an inspiring day! Sending Happy Thoughts Aubergine is such a rich fall color, and many things in nature sport this amazing hue. Lotus flowers come in many versions, and one is the lovely color of aubergine. Using a layered stamp made quick work of creating a few charming flowers to decorate a pretty card. A bit of Electric Yellow Amplify! adds the stamen texture to the lotus flower. 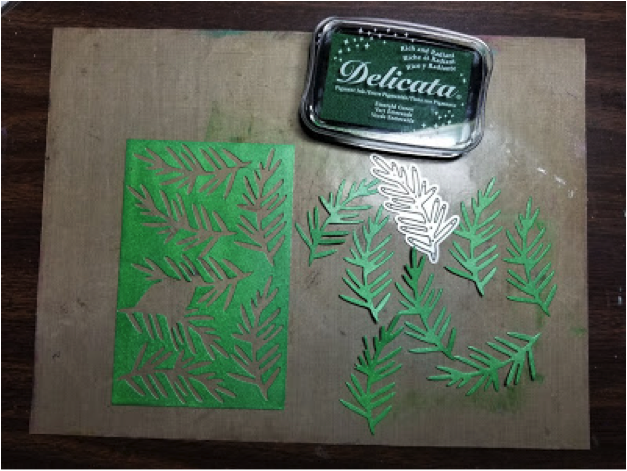 The basket weave background matches the leaves perfectly as the same Memento ink was applied to the embossing folder as was used to stamp the leaf images. Blending two colors Versa Magic ink creates a realistic color for the water of the pond, which reminded me of the photo that inspired this classic card. 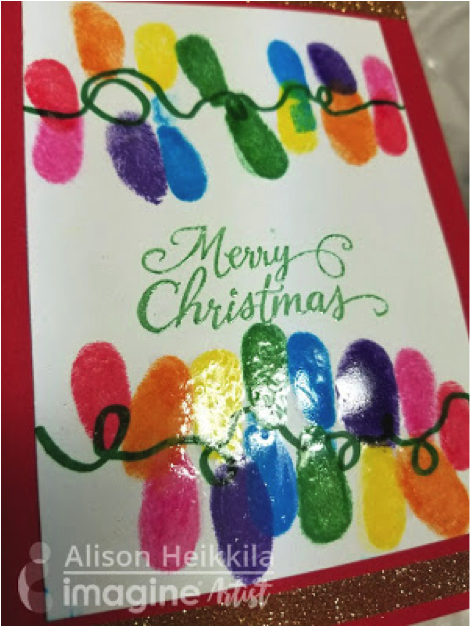 To carry the color theme throughout the card, a backing layer is inked with an ink blusher and matching Elderberry Memento ink. The sentiment is also stamped in the vivid Aubergine color to complete the look. Aubergine Aubergine, beautiful aubergine…this card was inspired by a lovely silk memo board I saw while I was out shopping one day. It was done up in blues which is why it caught my eye but I thought it could easily be used for Imagine’s color of the month – Aubergine. Sponge Neptune VersaColor over a 6×6 piece of white cardstock. No need to be tidy, this is only the base layer of color. Position the cardstock as shown on the ScorePal ; score every ½”. Rotate the piece of cardstock and score the cross lines. The cardstock should now look like this (back side shown). Crease all of the score marks to really make the lines stand out. Use the sponge dauber and apply more Neptune ink to every score line. The piece of cardstock will now look like this. Stamp images using several shades of Memento Dye ink and die-cut. Die-cut 3 frames; sponge Silver Delicata ink on one of the frames and on a 5.5” x 5.5” piece of white cardstock. Assemble the layers on a 6×6” aubergine card base. Double sided foam tape was used to adhere the largest flower to the card. The three frame layers were glued together with the silver frame on top. Silver irRESISTible Pico Embellisher was dotted where the lines crossed paths.